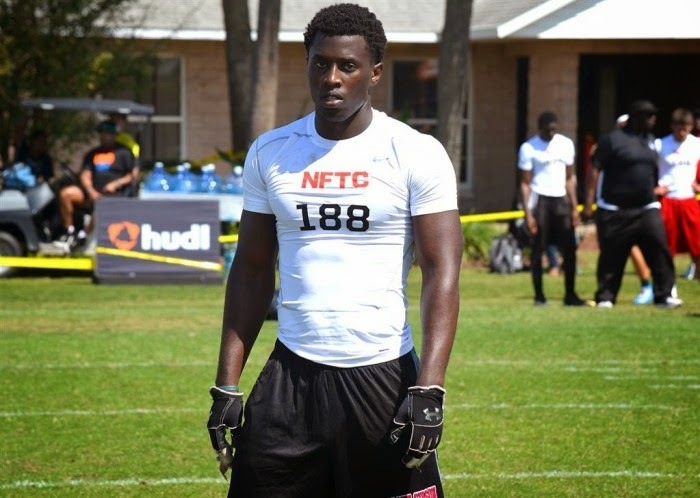 With plenty of prospects visiting Ann Arbor this weekend for official visits, 2015 defensive end Reuben Jones had decided he has seen enough, and committed to Michigan on Saturday night. 2011 Stats: 14 tackles, 1 tackle for a loss, 2 sacks, and 1 fumble recovery. Well, it almost took a month, but Michigan has landed their first commitment of the Jim Harbaugh era. 2015 defensive end Reuben Jones has committed to the University of Michigan, while on an official visit this weekend. Reuben took to twitter to announce his decision earlier today. Reuben, who decommitted from Nebraska on Thursday, becomes the first Michigan commit since Dele Harding committed to Michigan back on Halloween. Ranked as a 3* prospect according to 24/7, Reuben has a very impressive highlight tape. He’s got a good frame at 6’3 and 225 pounds to play at the college level. Reuben relies on his instincts and high motor to make plays on the defensive line. He has a good burst off the line of scrimmage and can beat his man on either the inside or outside. He does an excellent job of getting low and wrapping up on his tackles. Reuben has no problem either putting pressure on the quarterback or stopping the run game. He has the ability to win 1on1 battles at the line of scrimmage even though the offensive linemen are usually quite bigger than him. Once he reaches the college level and adds weight onto his frame, Reuben will have a lot more upper body strength, allowing him to gain leverage on the offensive line. Does a good job of keeping his feet moving while being blocked, allowing him to be able to twist the offensive line and get around them into the backfield. Reuben becomes the seventh commitment in the 2015 recruiting cycle joining; Brian Cole, Tyree Kinnel, Grant Newsome, Alex Malzone, Jon Runyan Jr., and Andrew David. Jones was recruited by D.J Durkin, Greg Mattison and Jim Harbaugh. The coaching staff is looking to fill 14-16 scholarships in the 2015 recruiting class, and only has two short weeks to accomplish this goal. With a DE spot already filled, look for the coaching staff to land 1-2 DB’s, 2 OL’s, 1 TE, 1 LB, and 1 QB before National Signing Day.